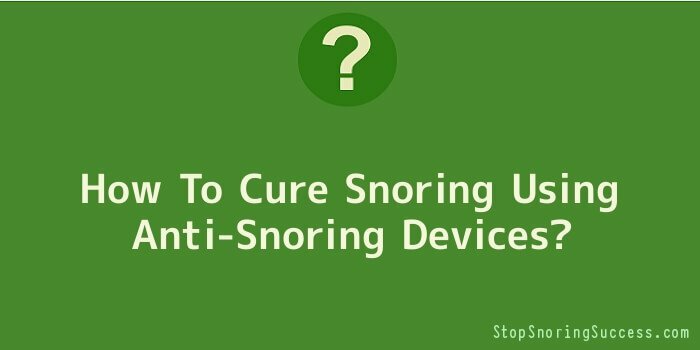 How To Cure Snoring Using Anti-Snoring Devices? Don’t give up your efforts to stop snoring, as snoring can lead to life threatening sleeping disorders. Snoring generally occurs when the nasal passage gets blocked due to the presence of mucus, and the soft palettes in the throat turn swollen and start vibrating. This causes the snoring sound that you hear. Snoring is not a pleasing to the ear and hence those sleeping beside you would spend sleepless nights. Using suitable anti-snoring devices can definitely make an effective cure for snoring. Check out the following if you’re looking for a cure for snoring. Snoring can occur due to an improper sleeping posture. For a few people, snoring occurs due to incorrect sleeping posture that will obstruct the passage of air while they breathe. Using anti-snoring pillows will provide support to the head and the upper body, so that airway stays open while you sleep. Snoring pillows are generally used for snorers who experience difficulty breathing at night. Snoring can occur if the nose gets blocked due to cold or allergies, and hence, one would have to breathe through their mouth, which leads to snoring. To prevent breathing through the mouth, one can make use of nasal strips that would open up the nostrils, and allow you to breathe through your nose much more comfortably. Nasal strips would be useful for mild or moderate snorers and on severe snorers nasal strips will not be effective. Snoring can also occur as a result of the lower jaw falling back. This prevents the airflow and hence the tissues at the throat would vibrate, causing the snoring sound. You can use an effective snoring mouthpiece that will support the lower jaw from falling back, and hence the snorer would have a good sleep at night. Mouth guards are a suitable cure for snoring, which causes sleep apnoea. Those who suffer from this trauma will definitely get relief after using a mouthpiece.